A petition to the world's governments gathering at the United Nations to discuss climate on the International Day of Peace. Please sign below and add comments. The United Nations was established "to save succeeding generations from the scourge of war" and is now addressing the scourge of climate change. We urge the adoption of an approach that addresses both together. 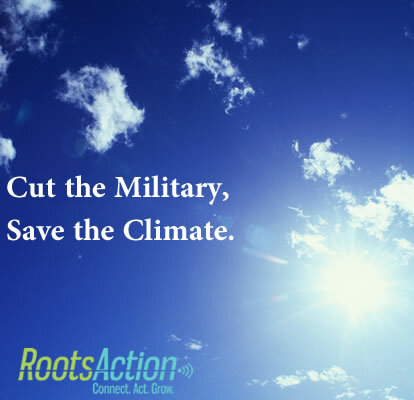 Since the Kyoto accords of 1998, the U.S. military has been exempted from calculations of greenhouse gas emissions, despite the fact that it burns more oil than do most nations. Wars that consume huge amounts of fossil fuels are often motivated in large part by a desire to control and profit from much greater amounts. In the process, large areas of the earth are rendered uninhabitable by mines, toxins, and other war waste. There is $2 trillion a year, globally, that could be invested in a major effort to protect the climate, were it not being invested in war and preparations for war. The United Nations must make disarmament an environmental cause. A world that turned away from war would have the vision and the ability to address the danger of climate change on the scale required. 16446 4.3 years ago sylvia anderson Albuquerque, NM , US Finally, a sane idea. God save us from our government.